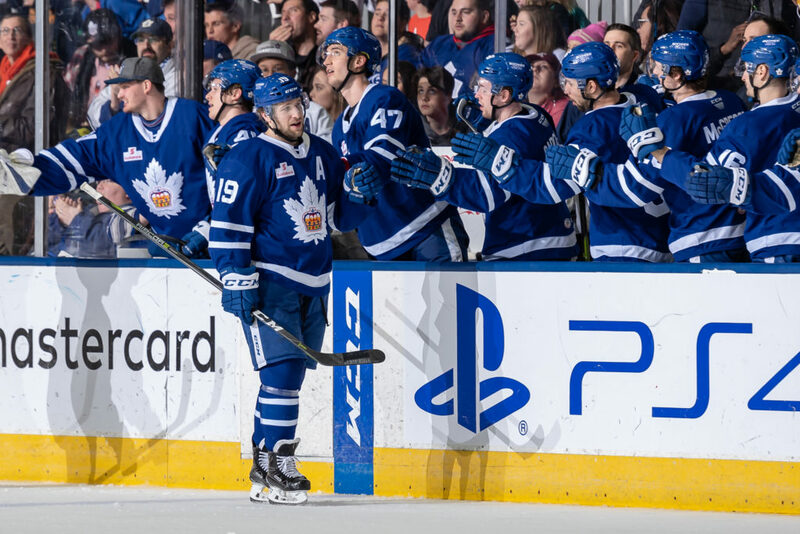 A hat trick from Chris Mueller and a shutout performance from Kasimir Kaskisuo lifted the Marlies to a 3-0 win over the visiting Laval Rocket. The Marlies came out of the gates hard, peppering Rocket goaltender Connor LaCouvee early and often. The Marlies put 12 shots on goal in the opening 20 minutes but were unable to find the back of net. The score stayed locked at 0-0 after 20 minutes of play. Chris Mueller opened the scoring at 5:35 of the second period, capitalizing on a power play opportunity. Dmytro Timashov fired a shot on goal that came off the pads of LaCouvee right in front of Mueller who was standing by to fire home the rebound. Timothy Liljegren added the extra assist on the goal. At 12:26, Jeremy Bracco sent a Adam Brooks and Mueller out to the races on a 2-on-1 , and they made no mistake as Brooks slid Mueller a saucer pass and he snuck it under LaCouvee for his second of the night. The goal set a new Marlies single-season franchise record with 31 goals in a 76-game season. The record was formerly held by Ryan Hamilton (12-13). The Marlies held a 2-0 lead heading into the final frame. Late in the final frame, the Rocket were pressuring as they looked to get on the board and cut the deficit. They pulled the goalie to try their luck with an extra attacker, leaving the door open for Mueller to complete his hat trick. Jeremy Bracco set him up and Mueller fired a shot from just inside the blue line into the empty net to seal a 3-0 win for the Marlies. Kasimir Kaskisuo made 19 saves to pick up his fourth shutout of the season. The Marlies will host the Hershey Bears for their final school day game of the season on Thursday, kicking off a three-in-three with an 11AM start at Coca-Cola Coliseum. They’ll then head out to Utica on Friday and close out the three-in-three in Binghamton on Saturday. Chris Mueller scored a hattrick – with a goal on the power play at 5:35 of the second period, a five-on-five goal at 12:26 of the second period and an empty net goal at 17:13 of the third period. With his second goal of the game, Mueller set a single season franchise record with 31 goals. Mueller has 22 points (13 goals, 9 assists) in his last 14 games. This is his second 30-goal season of his career. Dmytro Timashov recorded the primary assist on Mueller’s second period power play goal. Timashov has a point (2-2-4) in three consecutive games. Timashov has 48 points (14 goals, 34 assists) through 67 games this season. Timothy Liljegren registered the secondary assist on Mueller’s second period power play goal. Liljegren has 15 points (3 goals, 12 assists) through 39 games. Adam Brooks had the primary assist on Mueller’s second goal of the game and secondary assist on Mueller’s empty net goal. Brooks has 38 points (19 goals, 18 assists) through 57 games this season. Brooks has recorded 28 points (15 goals, 13 assists) since January 4. Jeremy Bracco picked up the secondary assist on Mueller’s second goal of the game and the primary assist on Mueller’s empty net goal in the third period. Bracco has recorded a point (4-12-16) in 10 consecutive games. He has 26 points (6 goals, 20 assists) in his last 23 games. Bracco is tied for the AHL-lead in points (75). Kasimir Kaskisuo stopped 37 of 39 shots he faced for his fourth shutout of the season. Kaskisuo is now 10-9-3-1 on the season with a .889 Save Percentage and a 3.30 Goals Against Average. Chris Mueller is the fourth Marlie to score 30 goals in a single season and only the second in a 76-game season. Chris Mueller scored his eighth game-winning goal of the season, tying the franchise record with Ben Smith (2017-18) and Matt Frattin (2014-15). This is the Marlies first hattrick this season and first since January 27, 2017 (A. Johnsson vs Syracuse). Toronto is 22-9-4-2 since January 4 and have outscored their opponents 121-103, facing 17 different teams. In 28 of 37 games, Toronto has earned a point (50). Toronto did not take a penalty for the first time this season and was 1-for-4 on the power play. Toronto had a 37-19 edge in shots in all situations. Chris Mueller led the Marlies with four shots on goal. Only one Marlie did not have a single shot on net (T. MacMaster). The Marlies are 25-14-7-3 against North Division opponents and finish the season 7-2-1-0 against the Rocket. Toronto has outscored Laval 24-16. Toronto is 30-9-1-2 when scoring the first goal. The Marlies are 12-7-3-1 when tied after the first period and 27-1-2-1 when leading after the second period. The Marlies are 13-6-0-0 in Saturday games and are 8-3-1-1 in March. Jeremy Bracco has points (4-10-14) in nine consecutive games. Dmytro Timashov has points (2-2-4) in three consecutive games. Tom Sestito (concussion) did not dress for tonight’s game. He has not played for Toronto since March 23 against Rochester. March 30: Signed forward Ryan McGregor to ATO. Well we just had a lot of really good things happening today. Some nights you’re really feeling it and today was one of those for us. I thought all lines and all of our defence moved the puck very efficiently, had a lot of pace, a lot of energy, so everything was clicking for the most part in the right direction for us today. When you do that, you’re going to have control of the game and that’s what we were seeking going in to the game, to just try and get control because that’s been an issue here for us for a while now and especially against this team, but a lot of good stuff today. You’ve got the team on the ropes and they’re getting pretty worn down. It was a nice opportunity for us to come back in the room and then reflect on what just happened but then also challenge our group to go out and do it again. That’s been an issue for us, is closing the game out and taking care of the game. I thought there was a few moments that we weren’t very good and we weren’t very responsible but for the most part, I thought we didn’t really give up a whole lot and the guys played right until the end. Well he’s got a lot of experience. He was brought in here last year mainly because of that experience and in particular playoff experience and playoff success. He’s a huge part of pushing our team over the hump last year and then coming back this season he’s clearly formed a great chemistry with Jeremy Bracco. That’s really where you see him take off offensively. He’s got a very business-like demeanor about him, he comes to work every day, he wants to make a difference and he wants our team to be successful. Those are all key ingredients when you’re looking at veteran players. I thought he did really well, he skated well, when he had the puck he made some plays, ripped on off the cross bar, had some scoring chances. So, as far as debuts go, that was a pretty good one, especially when you consider he hasn’t had a practice or anything, we just put him right in today so, I was happy to see that he brought a lot to our lineup. The Toronto Marlies are back on home ice tonight to host the Laval Rocket for a 7:00 PM start at Coca-Cola Coliseum. 600 members of the Canadian Armed Forces will be in attendance for the Marlies annual Canadian Armed Forces Night. This marks the 10th and final meeting between these North Division rivals with the Marlies holding a 6-3 lead in the season series. They last met earlier this month for back-to back games where the Marlies picked up 4-3 and 3-0 wins. The Marlies will be looking to make it two straight tonight after picking up a 5-2 win in Utica last night. They sit comfortably in third place with 83 points. 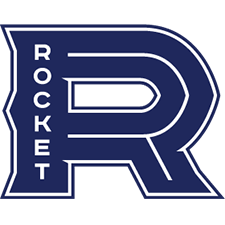 The Rocket will be looking to snap a two-game losing streak and pick up an important two points in a tight race for fourth place in the North Division. They currently sit in seventh with 68 points. Players to watch: With a goal last night, Jeremy Bracco set a new Marlies single-season franchise record with 73 points in a 76-game season. He sits atop the AHL in points and assists (53) and has points (4-10-14) in nine consecutive games. Rasmus Sandin picked up an assist last night, his 14th point in 10 games. The rookie defenceman has 26 points through 40 games this season. Alex Belzile leads the Rocket with 52 points (17 goals, 35 assists). He has points (2-2-4) in three consecutive games, including two goals in his last game. Puck drops at 7:00PM on Leafs Nation Network and AHLTV. Fans in Ontario can also stream the game live in the Toronto Maple Leafs App.